Sunset Rock is part of the Highlands Plateau Greenway and is a North Carolina birding trail. See the Highlands Plateau Greenway for more information on the Greenway and walks in the City of Highlands. Sunset Rock is an ideal choice for a late afternoon stroll in the Highlands area. A short 1/2-hour walk, approximately 0.7 mile one way, leads to a natural cliff side amphitheater where slabs of granite provide front row seats. Beautiful sunsets can be seen over Highlands and Brushy Face Mountain to the west. The vista of Horse Cove to the east (Sunrise Rock) is also worth the walk at any time of the day. 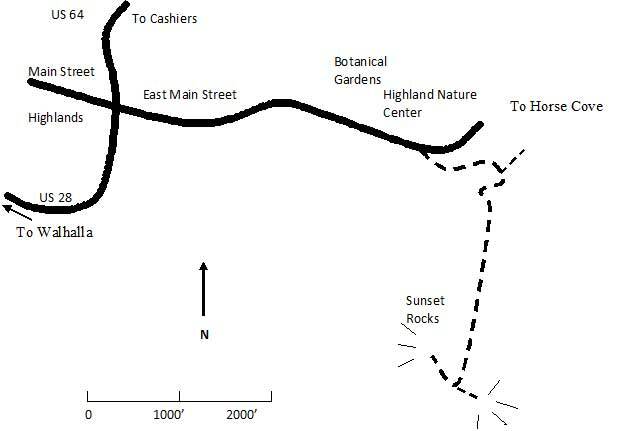 To locate the trail take Main Street (which then becomes Horse Cove Road) east from the intersection of Highways 28 and 64 in Highlands, 0.5 mile to the Highlands Nature Center. Park here and follow the sign indicating a gravel road to Sunset Rock and Ravenel Park. Although the trail is marked “Hiking Trail Only” it is a private drive so do not park as to block it. The road ends at a monument for Ravenel Park. Sunset Rock is to the right..
From Cashiers: Take Highway 64 west to Highlands – at the light on Main Street turn left. Travel 1/2 mile to Nature Center on your left. Across the street from Sunset Rock is the Highlands Botanical Gardens, a very interesting nature walk with all the plant life labeled.